Susan Adams has done it again! 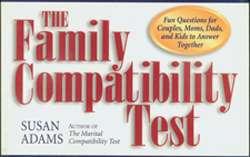 Continuing the tradition of The Marital Compatibility Test, she has written another unique book to enlighten and entertain. Her thought-provoking, yet amusing, discussion questions offer couples, moms, dads, and kids a refreshing opportunity to deepen understanding and communication. How ever diverse the make-up of your family unit, you’ll find hundreds of stimulating questions to ask each other. Explore and compare your views on topics ranging from in-laws to snoring to kids’ dating and driving. You’ll be amazed at what you can learn about the ones you love!